Senior Airman Andrew Flint, 21st Airlift Squadron loadmaster, directs a firetruck off of a C-17 Globemaster III at La Aurora International Airport, Guatemala City, Guatemala, April 20, 2018 during a Denton Program mission. The Denton Program is a Department of Defense transportation program that moves humanitarian cargo, donated by U.S. based Non-Governmental Organizations to developing nations to ease human suffering. The emergency vehicles were donated by the Mission of Love Foundation, they are the largest user of the Denton Program, having delivered medical, relief and humanitarian supplies to needy communities throughout the world. When emergencies happen in the U.S., the sirens of fire trucks and ambulances coming to the rescue can be comforting. Thanks to a C-17 Globemaster III crew from Travis Air Force Base, Calif., indigenous Mayans in Tecpan, Guatemala, will now hear that same sound of hope and help. 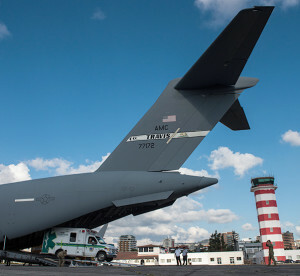 The crew made up of Airmen assigned to the 21st Airlift Squadron and the 860th Aircraft Maintenance Squadron delivered the ambulance and fire truck to Guatemala City, Guatemala, April 20, 2018. They were donated by the Mission of Love Foundation and shipped through the Denton Program. The Denton Program is a Department of Defense transportation program that moves humanitarian cargo, donated by U.S. based non-governmental organizations to developing nations to ease human suffering. The approved cargo is transported by DOD land, air or sea assets on a space-available basis and is managed by the U.S. Department of State and DOD. The Mission of Love Foundation has been working in Guatemala for the past 24 years and are the largest user of the Denton Program, having delivered medical equipment, relief and humanitarian supplies to needy communities throughout the world. A U.S. Air Force C-17 Globemaster III from the 21st Airlift Squadron at Travis Air Force Base sits on the flight line after arriving at Youngstown Air Reserve Station, Ohio, April 19, 2018, to pick up Denton Program cargo. The Denton Program is a Department of Defense transportation program that moves humanitarian cargo, donated by U.S. based Non-Governmental Organizations to developing nations to ease human suffering. The approved cargo is transported by DOD land, air or sea assets on a space-available basis, and is managed by the U.S. Department of State and the DOD. It was a team effort to deliver the emergency response vehicles, and an important part of that team was the Air Force Reserve Airmen at Youngstown Air Reserve Station, Ohio, that helped package and load the vehicles. 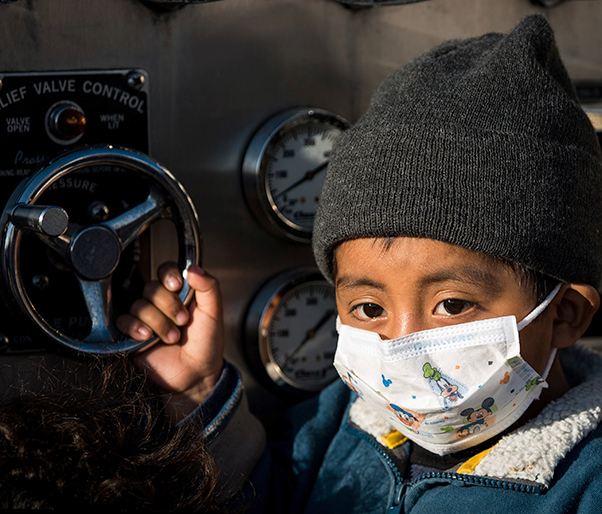 An indigenous child with cancer stands on a firetruck that was delivered to Guatemala City, Guatemala by the 21st Airlift Squadron through a Mission of Love Foundation and the Denton Program, April 20, 2018. The Denton Program is a Department of Defense transportation program that moves humanitarian cargo, donated by U.S. based Non-Governmental Organizations to developing nations to ease human suffering. The emergency vehicles were donated by the Mission of Love Foundation, they are the largest user of the Denton Program, having delivered medical, relief and humanitarian supplies to needy communities throughout the world. A lot of planning has gone into making this mission a success. All the planning paid off and the Airmen were able to deliver the emergency response vehicles to a thankful reception in Guatemala.